We offer the latest technology in drafting services for SolidWorks and Autodesk Inventor. 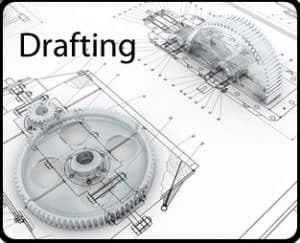 From Model Based Definition to paper drawings, we can provide the drafting service you need. Model Based Definition (aka 3D Annotation) can be applied to your models, or we can produce models here in our office. All we need are your mechanical drawings. We will apply your drawings specifications directly to the model. MBD can be applied to models without mechanical drawings, but an engineering analysis will be required. Tolerance stacks and functionality of the parts and components will be studied to establish tolerance requirements for each dimension. Standard 2D Mechanical Drawings can be produced from paper drawings, pdf, or models containing PMI. We can also import AutoCAD, SolidWorks, and Autodesk Inventor drawings. If you have a different format, call us. We may be able to import it. We can construct Mechanical Drawings in SolidWorks, Autodesk Inventor, PDF, AutoCAD, and DXF formats. If you require a different format, call us. We may be able to produce it for you. 3D annotation goes by many names such as Product and Manufacturing Information (PMI) and Model Based Definition (MBD). But the result is the same, a fully defined 3D model. Computer based models of this nature need professional clarity. That is, vendors, fabricators, and inspection shops need to be able to clearly see and understand the specifications defined by the model. So our staff is professionally trained to produce fully defined and easy to read models. Model Based Definition has not fully replaced 2D Mechanical Drawings. So we offer both MBD and 2D Mechanical Drawings. This gives us a broader vendor base to choose from, which ultimately reduces cost. In the past, this is how a manufacturer knew what you wanted. This is the contract for what parts you want and the exact sizes they are allowed to be. Plastic Product Development takes years of experience to master because it requires a complex matrix of skills. Functional design as well as manufacturability play a key role. Not only does the product have to perform, you have to be able to manufacture and assemble it hundreds or thousands of times. Let’s say a manufacturer of one part in your product makes 10,000 parts that are out of spec. That is, they do not match the specifications in the Mechanical Drawing of the part. Usually this means the part will not function correctly in the assembly of your product. Do you have to buy the parts anyway? The answer is an astounding no. When you order parts from a manufacturer you order them using Mechanical Drawings. If a part does not match the Drawing, it is not what you ordered. The manufacturer’s responsibility is to provide you with parts that match the specs in Mechanical Drawings. So a Mechanical Drawing becomes the legally binding document in your agreement to purchase parts. This concept extends to any type of purchase you may make for components and assemblies. For example, when you purchase prototypes, they have to meet the specifications in the drawings. When you have production tooling fabricated, the tooling has to make parts that meet the specifications in the Mechanical Drawings of the parts. While the Solid Model is used to create cutting paths to make the tooling, tooling is approved by confirming that the parts it makes conform to the specs in Mechanical Drawings.